"Seven Hells! ": June 3rd Is "Punch A Rannie In The 'Nads Day." June 3rd Is "Punch A Rannie In The 'Nads Day." According to "Robby Reed" at Dial "B" For Blog, Rann's "superweapon" will be operational come Friday, June 3rd. 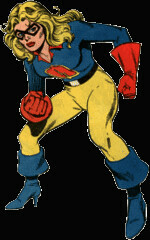 I've enlisted the aid of a former teammate of Hawkman's, the venerable Liberty Belle. She has pledged to help halt the "superweapon" by punching Adam Strange in the 'nads and then proceeding to kick him with her pointy shoes. I encourage more of this behavior. Punch Adam in the nads all you want to! It will not stop Rann's new superweapon from DEVASTATING the Thannies! They have only one day left to surrender! Anything that encourages the use of the word "nads" is A-OK by me, sir! "She has pledged to help halt the 'superweapon' by punching Adam Strange in the 'nads and then proceeding to kick him with her pointy shoes." Some people pay good money for that kind of thing. I can draw. We can make it happen.